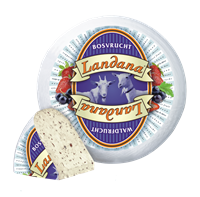 Landana Goat cheese FOREST FRUIT is a delicious cheese with a sweet, fruity flavour. This specialty cheese with fine pieces of fruit is made out of 100% Dutch, healthy goat’s milk. Fits perfectly on every cheeseboard as a sweet surprise and is a great addition to salads with fruit or as a snack.